Sometimes it can be difficult to keep up with your bills. Maybe they have come in the mail and you put them aside to deal with later. You get busy, and suddenly you're late on a payment. While everyone can slip once in a while and be late on a payment, doing so can affect your credit rating. The lower your credit rating, the more it will cost you in many ways. So, you're a good person, you don't mean to pay your bills late. How can you get a better handle on making sure you pay things on time? Fortunately, technology has given us great choices when it comes to staying on top of bills. 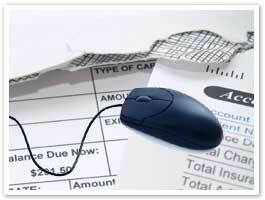 In my opinion, the best way to keep on top of your bills is to use online bill payment. It doesn't cost anything (at Destinations, it's free if you pay at least one bill per month). It's easy to set up and use. And, best of all, you can schedule your payments to go out when they are due...enter them as soon as you get the bill, then forget it. You enter they payee information only once, then any time you want to pay, just click the payee then enter the amount and the date to pay the bill. You can also schedule recurring payments if the amount doesn't change. Set up the payment to go out monthly on a specific day of the month. It's safe - there are many layers of security to protect your account. There are other ways to use technology as well. You can generally go to the company website for payments such as your mortgage, BGE, phone, etc. These sites permit you to set payments to come out of your account automatically. The drawback to this method, is that it takes the control away from you and puts it in the hands of others. Being the control freak that I am, I want to schedule the payment myself. 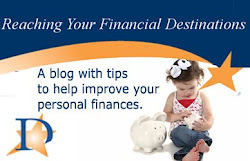 It is also more difficult to stop your payments if you need to. If you are a true technophobe, you probably wont be reading this blog anyway. For those who don't want to pay online, look for simple low-tech ways to organize your bills. Before the days of the internet, I used to have a desk calendar that I knew I would refer to every day. I used to put my bills in the calendar for the day that I needed to write the check and mail it. Whatever method you use, make sure to pay all of your bills on time, every time. That will help maintain a high credit rating and save you money on loan interest, insurance rates, and more.